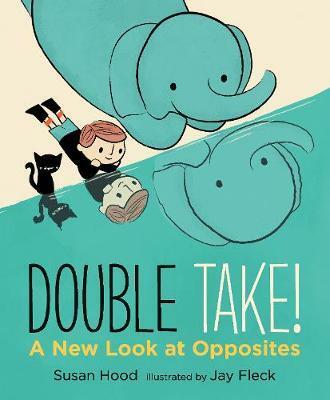 As the title suggests, this book is a new offering on the ever popular topic of opposites. Rather than single words conveying the opposites, Double Take! is a complete story that can be read at bedtime, with the added bonus of being a strong learning experience. What really sets this book apart however, is it's inclusion of relativity. At first the elephant is strong and the boy is weak, but when elephant is compared to a whale, then is elephant still the strongest? Other relative concepts explored include near and far, ahead and behind, and above and below. This view on changing perspectives was extremely well handled, both in maintaining the rhyme and rhythm of the story, and not over complicating the concepts. The illustrations, depicting the three main characters of a boy, a cat and an elephant, are lively and full of action. The use of wide space around these main characters, and the cool colour pallet combine to create a peaceful and calm reading experience, without too many details to distract or overwhelm younger readers from what can be a challenging new concept. The flawless rhyming text creates not only an enjoyable story to read along to, but can also act as a prompt for children as to what the next opposite word will be.With my kindy daughter in the throes of learning to read, she is really drawn in to texts with rhyming words and loves trying to figure out what word might be coming next. With all of the opposite words in capital letters to stand out from the rest of the story, and finished with a stunningly embossed hardcover and paper quality to swoon over (if you like that sort of thing!) the overall production of this book is amazing.